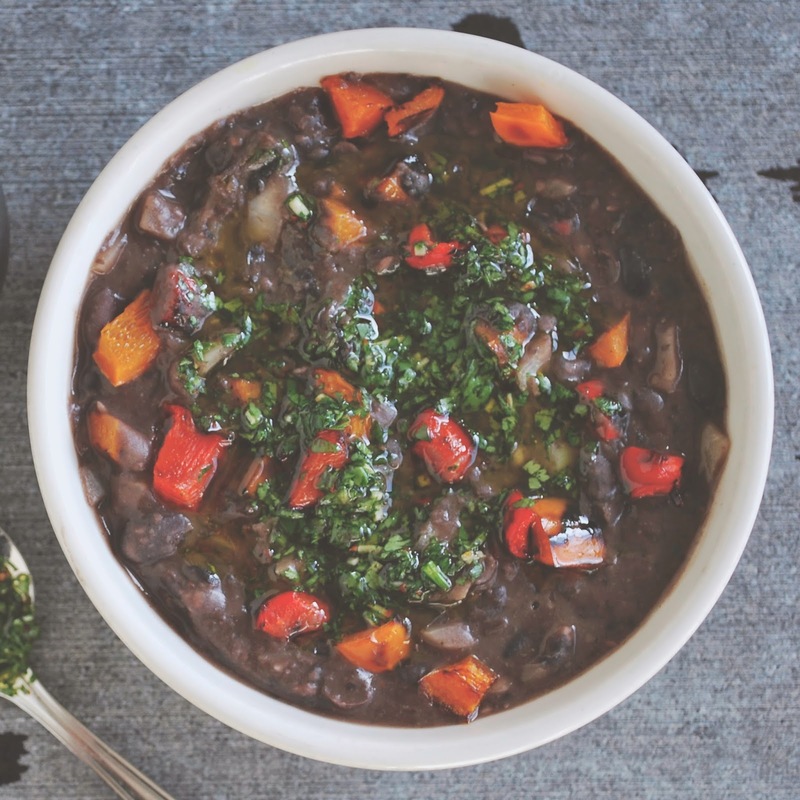 the jar of emerald-green chimichurri sauce has been sitting on my kitchen counter, rapidly diminishing in volume as i seem to have added it to every other meal the past few day. 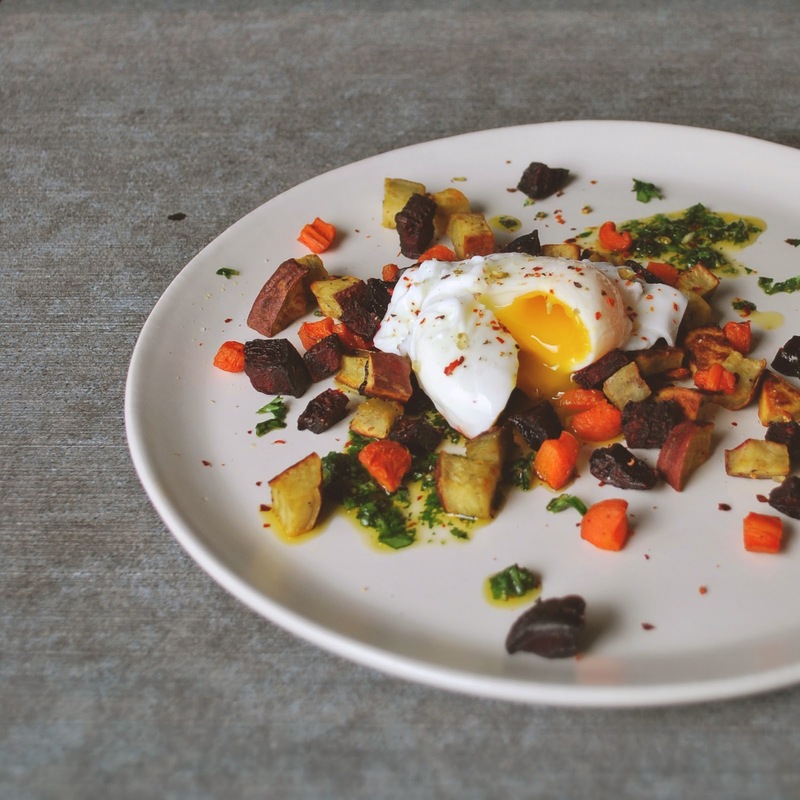 i smothered it over black beans, rice, and now spread it under my go-to breakfast combo of roasted root vegetables and runny eggs. i've played around with different root vegetables but most importantly, i love having variety in color and flavor. today, i roasted two full trays of beets, japanese sweet potato and carrots, but you could use whatever root vegetables you enjoy or have on hand. preheat oven to 400 degrees. clean roots, peel any particularly rough patches of skin otherwise leave skin intact. cut roots into small cubes, the size of a hazelnut or slightly larger. (note: i like to roast my beets on a separate baking sheet, otherwise everything turns pink when you toss the vegetables.) 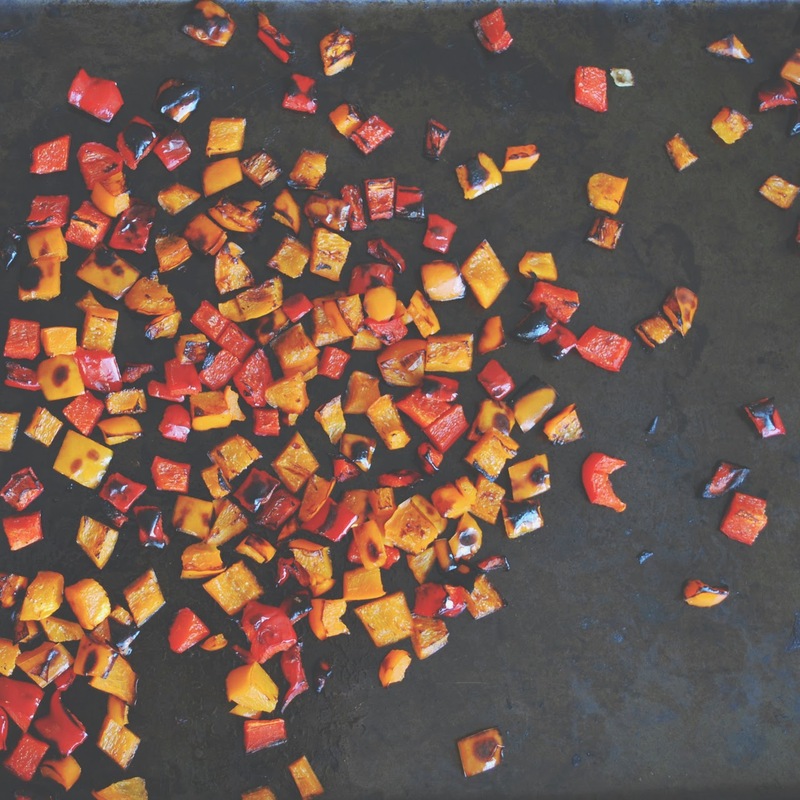 spread vegetables out on two baking sheets, drizzle with a tablespoon of oil on each tray and use your hands to toss veggies with oil until coated. season with salt and pepper. do not over-crowd your vegetables. if they are too close together, they will just steam and wont get nice and crisp and brown. roast for 30-40 minutes until lightly brown. stir every 10 minutes or so. 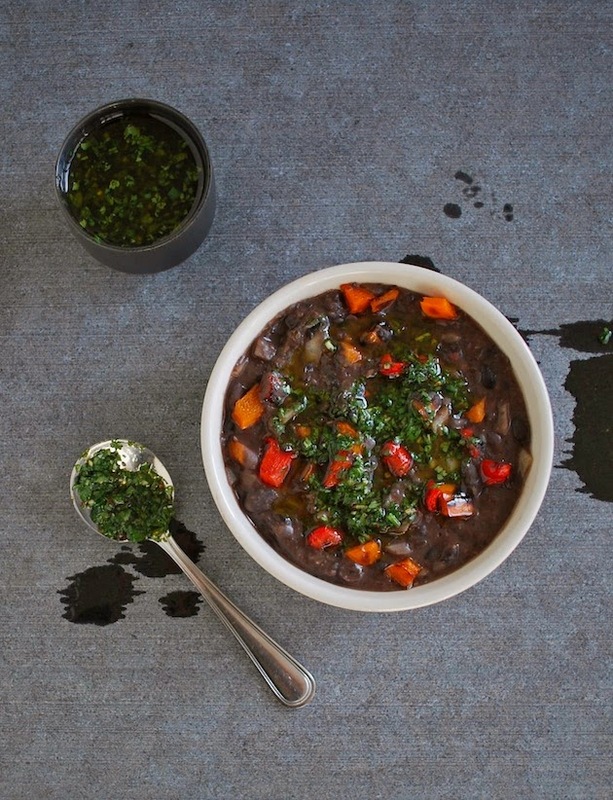 serve with a spoonful of chimichurri sauce (recipe from my previous post) and one or two eggs any style you like. i love runny, saucy yolks, but if you prefer firmer eggs, those would be just as delightful. 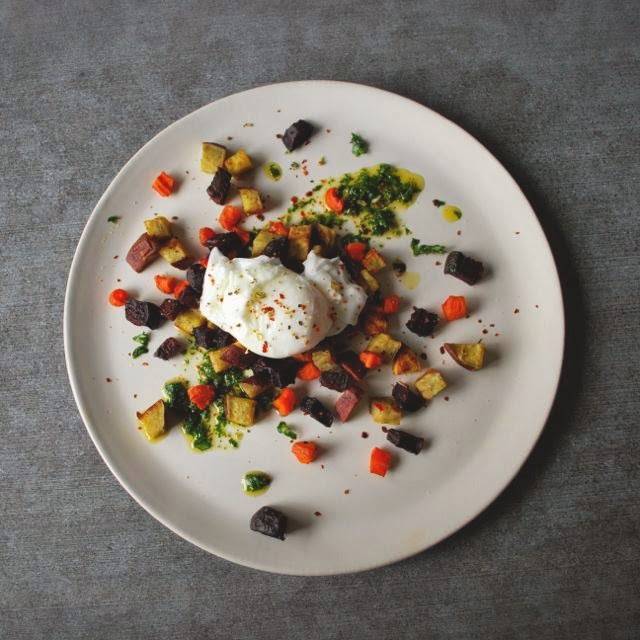 for perfectly soft poached eggs, bring two inches of water to boil in a small sauce pan. once it comes to a boil, lower the temperature back to a low simmer so that there are gentle little bubbles. crack an egg into a small cup. then start to stir the water with a large spoon to start a whirl pool motion. stop stirring for a second and lower the egg into the water from the cup, gently! the whirl pool will help keep your egg whites together. let cook for a few minutes and then scoop out the egg with a slotted spoon. test it with your finger for done-ness. if you want it firmer, plop it back in for a minute or two. cook to your desired firmness. then let the egg rest back in the cup until your are ready to serve it. my father has never been shy to ask for recipes. if you invite him to dinner, he will either ask for the recipe or try his best to replicate a dish from memory. if he is enjoying a meal out, he might ask the chef straight up for the recipe. or at the least, to identify some flavor he can't place his finger on. this, i learned, is the secret to becoming a great chef. ask questions, take mental notes, remember flavor combinations and fearlessly try to replicate dishes you've enjoyed in the past. 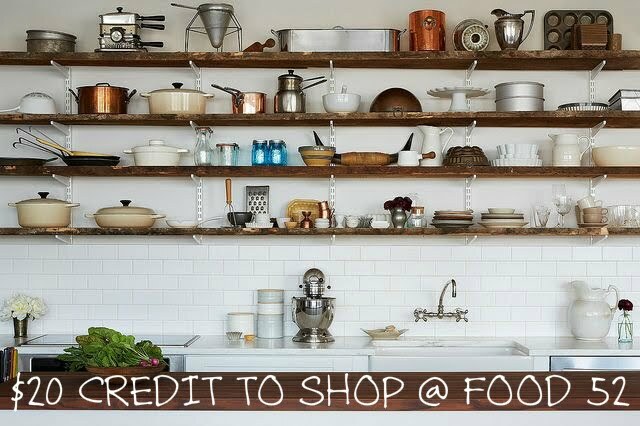 eventually, your recipe repertoire will grow and you yourself will become an intuitive cook. sometime when i was in elementary school, my dad signed up for a cooking lesson with a parent of one of my aikido classmates. (i never did ballet or gymnastics as a girl, i did softball and aikido and played african hand drums. tom boy much?). anyhow, this is how hum bow became one of my family's favorite go-to meals and a recipe in my dad's vast repertoire that he loved to show off to dinner guests. it's been years and years since i last made hum bow with my dad, but just the other day, david had a hankering for hum bow from his favorite shop in the pike place market, and i decided it was time to finally make some for myself. we made some with left over roasted chicken, but in the past i've made a fabulous vegetarian version as well. *the best substitute i've found for bbq pork inside of hum bow is firm baked tofu. the store bought kind is actually ideal, because it has so little moisture. if using fresh tofu, you will first want to press and bake the tofu to remove the moisture. *honestly, the only secret to delicious hum bow is hoisin sauce. (later this spring, david and i are signed up to take a pho cooking class, in which we will learn to make our own hoisin sauce. so until i have an updated recipe for you, store bought sauce is simple and perfect). *the recipe my dad passed on to me called for 3 1/2 cups self-rising flour. i did not have self-rising flour in my pantry, but supposedly you can mix your own by adding a certain ratio of salt & baking powder. this seemed to work just fine. wax paper, cut into a dozen 3"x3" squares. in a large bowl, mix all ingredients together until thoroughly combined and let rest for 15 minutes. after, kneed the dough on a large floured surface for no less than five minutes. continue to add a tiny bit of flour if the dough starts to stick to your surface. eventually, the dough should start to soften slightly and become smooth in texture. at that point, cut the dough into 12 evenly-sized dough balls. let them rest on floured surface while you prepare the filling. if using fresh firm tofu, you will need to do a bit more prep to remove the moisture: first, place tofu between two paper towels on a plate and weight down with the heaviest flat object in your kitchen (for example a cast iron skillet). let rest for 15 minutes. in this time, preheat your oven to 350 degrees. afterwards, pat the tofu dry and cut into 1 inch cubes. place tofu on parchment lined baking sheet and bake for 20-30 minutes, rotating the cubes every 5 minutes or so, until all edges are nicely browned. alternatively, you can purchase baked tofu in health food stores or even at trader joe's. they are often marinated, so just choose one with soy sauce or teriyaki if you cannot find plain baked tofu. 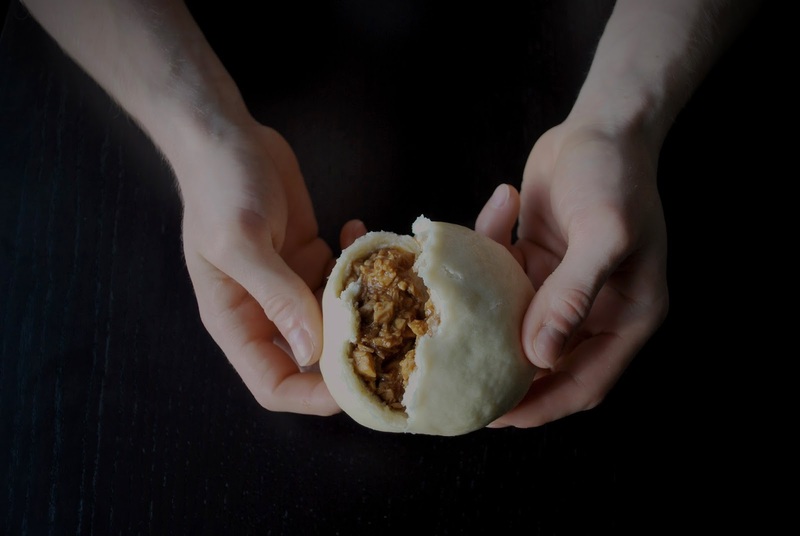 and if you want to make meat filled hum bow, your could just swap the tofu out for 2 cups of cooked pork or chicken. once you have your baked tofu, roughly chop into small bits and toss into a bowl with 1/2 cup hoisin sauce and a teaspoon of sriracha. you want the tofu to be thoroughly coated, so add more hoisin sauce if needed, and add more sriracha if you want some added heat. in a large pot, bring about two inches of water to a simmer. set up a multi-layer bamboo steamer or just a single basket steamer - making sure the water level will not touch the buns. place the buns with their wax papers in the steamer leaving an inch of room between each bun. cover and steam for 20 minutes over medium-low heat. once done, remove hum bow from basket and let rest for a few minutes before serving. if working in small batches, steaming 3 or 4 buns at a time, watch the level of the water and add more, returning back to a simmer if you need. we went out for indian food this weekend with another couple, and debated at length to figure out what to order to share family-style. this lead to a conversation about our inabilities to order something besides our all time favorite dish. when i think of my most frequented restaurants, i'll admit that i typically order the same thing, every damn time. sometimes i force myself to branch out and try something new but this often leads to a serious case of food-envy when you see someone else order your go-to dish. no matter how tasty your meal is, it just doesn't compare to your favorite dish. to back track a bit... remember those earl grey date bars i posted last week? well, i may have blown through then entire batch already with very little help from my guy. i should have made a larger batch. i considered remaking a batch, but tenuously decided to try a variation. considering it was risky business, i opted to make a half batch of dough. thankfully, you can't go too wrong once you add chocolate into the equation. so there was no food envy. there were no regrets. there was just pure delight. preheat oven to 350 degrees. soak chia seeds in water and let rest for 10 minutes. to make the dough, pulse oats in a food processor until you create a coarse flour. add coconut sugar, baking soda and sea salt and pulse to combine. add melted coconut oil, chia seed gel and vanilla extract and pulse until a dough forms. 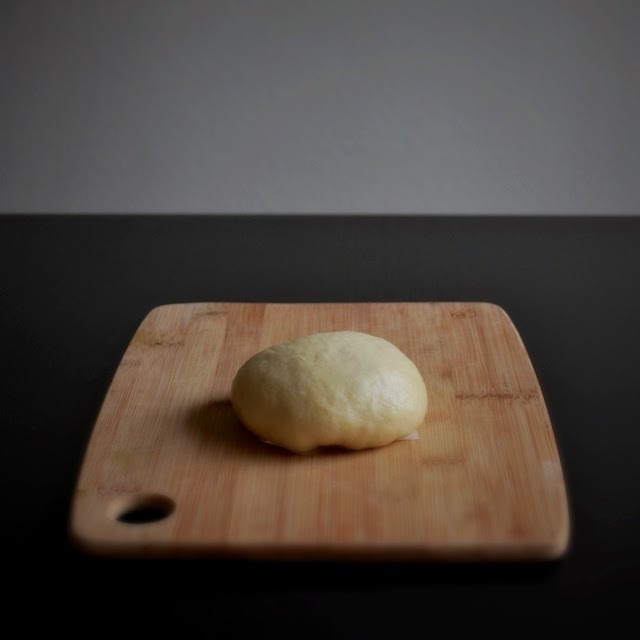 scoop out a tablespoon of dough at a time and roll in your palms to form a smooth dough ball. 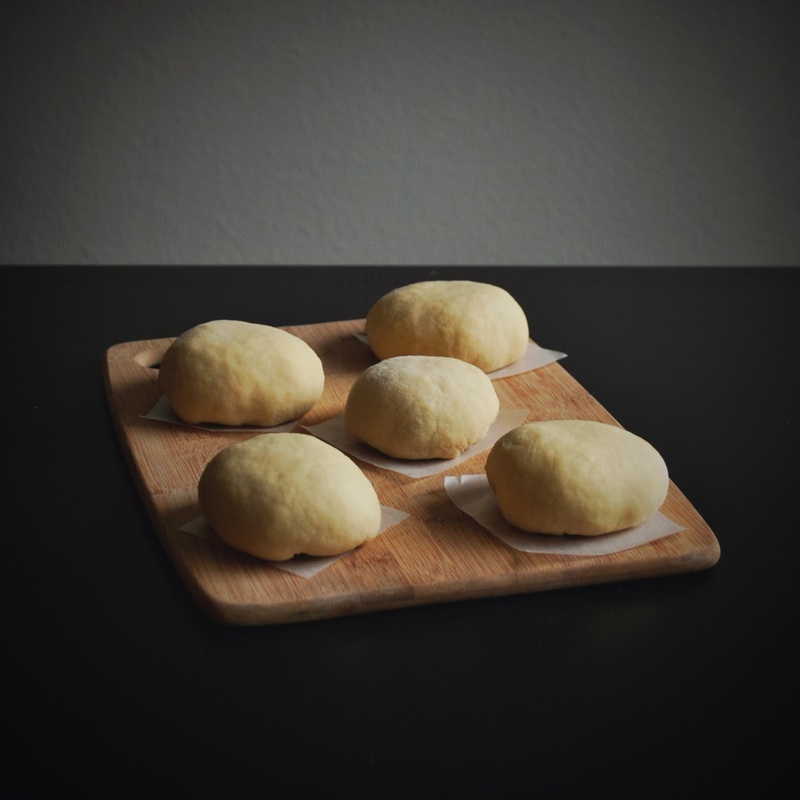 place dough balls on a parchment-lined baking sheet with an inch of space between each cookie. bake for 10 minutes. remove from oven and use your thumb to gently press a well into each cookie. return to oven and bake for 8-10 more minutes, or until lightly browned. let cool on a baking rack. in the mean time, bring a few inches of water to a simmer in a small sauce pan. rest a heat-proof bowl (glass or metal) over the steaming water. use a bowl large enough to not slip into the sauce pan. place chopped chocolate (or chocolate chips) in the double boiler and stir for a few minutes until completely melted. use a teaspoon to slowly spoon the melted chocolate into the thumbprints. 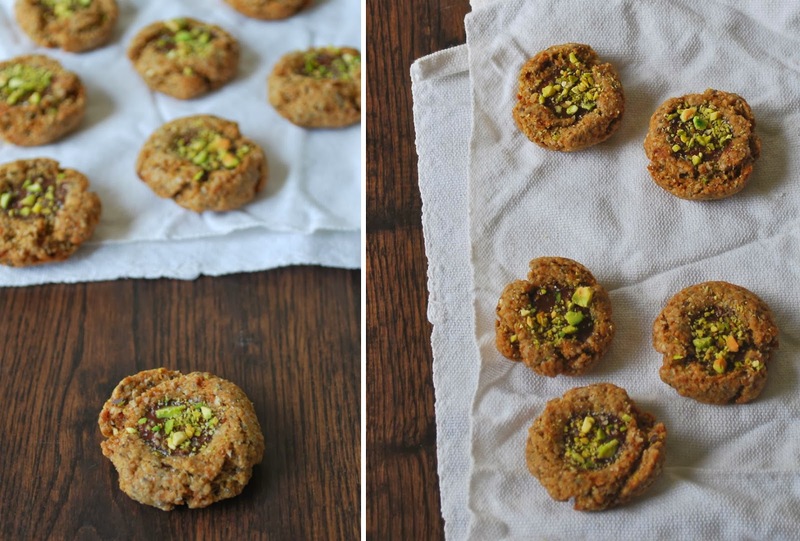 sprinkle each cookie with a dusting of crushed pistachios and a pinch of sea salt. let cool completely to allow the chocolate to harden. for me, the greatest benefit of unemployment is the ability to spend more time developing my yoga practice. i am forever grateful for the generosity of one of my mentors, for floating me along as i flounder through unemployment. i've truly enjoyed settling into a schedule of a daily practice - something i have never made time or space for in the past ten years of practicing yoga. but when your schedule is released from the constraints of a forty-hour work week, you have no excuse to not roll out your mat, even just for 20 minutes each day. timing meals around yoga is fairly important, as it is difficult to lie on your belly or do core work with a fully stomach. but i wake up hungry and would be grumpy by the 11 am if i just skipped breakfast entirely and hoped on my bike for morning yoga class. 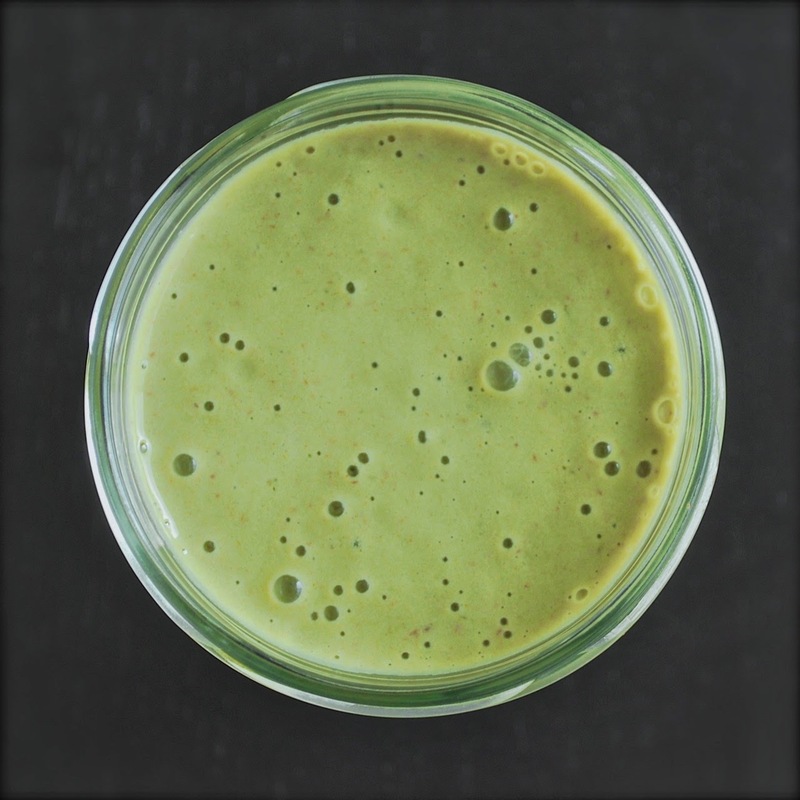 so instead, i've created the perfect little smoothie with matcha green tea powder for a boost in energy and metabolism to benefit a workout. matcha is made of crushed green tea leaves, and has 10x the amount of antioxidants of a cup of green tea and slightly less caffeine than a cup of black coffee. it's also delicious. here's a little secret... i love almond milk in smoothies! it is far lower in calories and sugar than juice, and adds a wonderful creaminess. additionally, adding a little healthy fat to smoothies helps you absorb the other nutrients and sustains you longer. so for a longer than i care to admit, i was blending almond milk and nut butters into my smoothies. then i realized what a total waste of money and added processing this was! it occurred to me that i could make my own almond milk, and just not strain the almond meal. i want those healthy fats and fiber! i call it 'cream top' almond milk. the full fat version. soak almonds and dates overnight in several cups of water. in the morning, drain from soaking water and place in high speed blender with 4 cups fresh water. blend at highest speed for about one minute, until almonds break down to a fine meal. store in an airtight jar and use within a week for smoothies! or! 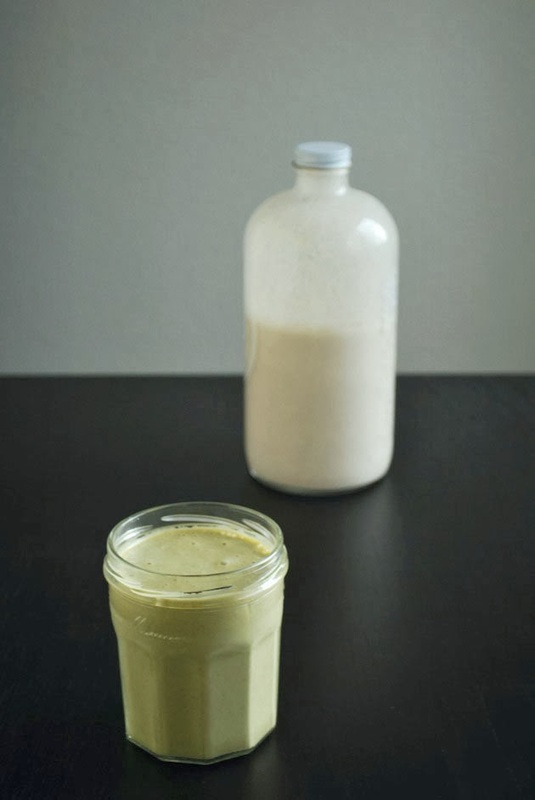 if you just want one smoothie to try out, you can soak just a date and 1/4 cup of almonds overnight and blend into your smoothie in the morning. soak almonds and date overnight in a cup of water. in the morning, strain and place into high speed blender with 1 cup fresh water and remaining ingredients. you may adjust the amount of matcha powder and ginger to taste. blend until smooth and drink 30-60 minutes before exercise or whenever you need an energy boost. this smoothie is only about 300 calories, so it isn't a full meal but great for a pre-yoga/workout snack! you could easily expand this smoothie, adding a full banana, your choice of protein powder and a bit more water.